Wow.com had some fascinating, spoiler-laden news about the Forsaken and their state of affairs come Cataclysm. Obviously, this involves significant Cataclysm spoilers. WoW.com's article: "Sylvanas' plans no one saw coming"
If you don't want to click the link, here's a quick summary: Sylvanas meets with Garrosh to inform the new Warchief that she's figured out how to solve the dwindling population problem the Forsaken have always faced, and it involves enlisting the help of the now-masterless Val'kyr. Her solution? Create NEW Forsaken out of fallen corpses. Garrosh is disgusted and tells Sylvanas as much, and leaves guards behind to "guard" the Banshee Queen and keep him informed on her doings. First of all, from a story perspective? This is awesome. The Forsaken history and evolving storyline is one of my favorite plots in the game, as it is tragic, deliciously devious, and very unpredictable. I find their stuff simply more interesting than many of the other storylines. One of my favorite elements in Wrath was FINALLY seeing the Forsaken's anti-Scourge plague come to fruition, seeing as how they'd been working on it (with our help) for YEARS (aka many levels). I was wondering what they would do with Sylvanas and her people now that their major carrot-on-a-stick (Arthas) is out of the picture. This smoothly addresses one of the larger hand-waves with the Forsaken that's been around since Vanilla, and does it in a very tantalizing manner. This development raises all sorts of questions...some of them ominous and worrying! We never thought it would happen, but Garrosh actually comes off looking like the good guy here. Granted, he's still got his cranky little verbal jabs, but he's surprisingly level-headed and philosophical, and seems to be taking his position seriously. Not once does he mention military advantages or how they can use Sylvanas' new trick against the Alliance. Everything he said could have easily come out of Thrall's mouth (though Thrall would have been infinitely more diplomatic). It's very interesting. Of course, I still think they're going to humanize him and make him more likable before Cataclysm hits, which would correspond with his less extreme personality shown here. The Lich King is Dead...or is it? Here's something I haven't seen discussed. 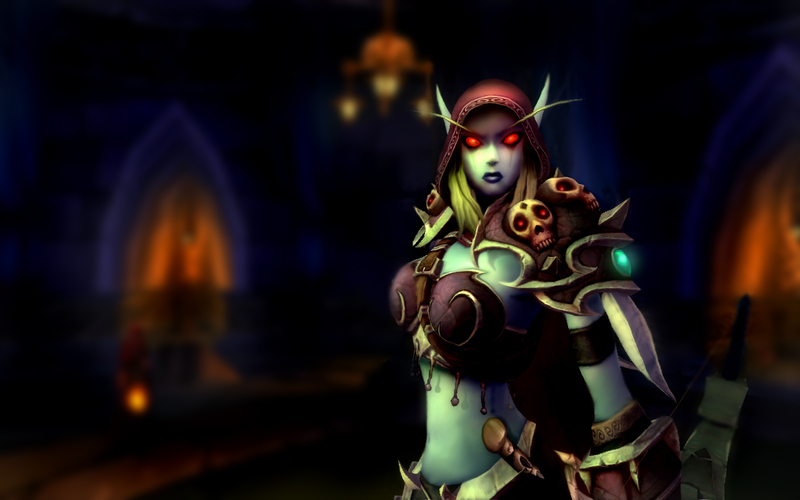 Sylvanas has never existed in her undead state without her creator - Arthas - "alive" and well somewhere. Now, the theme of a created creature being eternally bound/connected to their creator is nothing new...so what if that's what is happening here? This "creating new Forsaken" thing is pretty extreme, even for Sylvanas. Seems very...Lich-King-ish, actually. What if Arthas' death is having unexpected effects on her? There's all sorts of nasty things that could be happening - she might be losing her grip on sanity with her "master" dead and with no overpowering motivation to drive her. Or maybe she's actually deteriorating and dying now, and her now-directionless desire for vengeance is pushing her to commit a final, brutal assault on the living before she goes. Or maybe Arthas' death has awakened a deep-rooted contingency plan that has laid dormant since her rebirth as a banshee. After all, she's probably the most powerful minion the Lich King ever created, at least on par with Kel'Thuzad and Anub'arak. Strangely powerful, in fact - she possesses abilities and magic that, when you think about it, really don't make sense considering she was a ranger (hunter) in life, and not a sorcerer or archmage. Amongst all the Scourge ever created by the Lich King, Sylvanas is unique in many ways. It could just be because of the incredible strength of her soul/personality...or it could be for other reasons. In roleplaying fantasy, liches embed a portion of their life force into special gems or idols called phylacteries. Even if their physical bodies are destroyed, they can eventually recover and regenerate so long as their phylactery is safe. I'm going to go out on a wild limb and speculate that Sylvanas herself is the Lich King's phylactery, and that so long as she lives, the Lich King can never truly be destroyed/imprisoned. After all, we did "miraculously" escape with Sylvanas in Halls of Reflection, despite being completely overpowered. I know there's holes in this theory (primarily Bolvar, the "new" Lich King), but at this point it's just speculation. Regardless of what is actually going on in Sylvanas' head, I am extremely interested and intrigued to learn what happens next! This entry was posted on Friday, July 2, 2010 at 3:22 PM and is filed under arthas,forsaken,garrosh,lore,npc spotlight,predictions,sylvanas. You can follow any responses to this entry through the RSS 2.0 feed. You can leave a response. I am excited about this also. Sylvanas is one of my most favorite characters in the Warcraft Universe. Her story is very compelling. Even the Forsaken story is compelling. So I am eager to see how it plays out in Cata. I think you also bring up very valid points as far as Sylvanas goes. Just have to wait and see! I know I'm so late commenting (sorry!) but thank you for writing this - I hadn't known the story that was going on with Sylvanas in Northrend. Nor had I made the connection of her story (the vague idea I had of it in my head) to the Big Bad Guy in Northrend and what it might mean for her right now.